Watercolor techniques are fundamentally different from oil- or acrylic painting techniques, because you don't work with thick, hiding paint. You just sort of stain the paper. Watercolor techniques are great if you are looking for some purity, lightness and serenity. It can give translucent, immaterial colors, like those in the atmosphere. Don't use white: let the paper shine through. Start with stronger diluted paints. But: watercolor paint looks darker when it's still wet, later on you don't have to be afraid of dark paint. Buy thick paper, the 'rough' quality of Saunders and Waterford (I use the 140lb quality) is the best I know. If you choose a lighter (thinner) quality, stretch your paper. Learn how the water flows, never leave your painting alone to dry. Keep a cotton cloth at hand to pick up unwanted flow, and big jars of cleaning water standing by. Give yourself some good watercolor brushes (marter or squirrelhair). For filling in bigger surfaces, take a broad and flat one. Be careful with previous layers when you paint - they partly wash out again, when you brush into them. A painting on it's back won't drip. And if you put it up, you can use the flow. Check here for more on watercolor supplies, and here for paints. 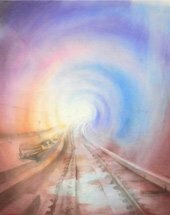 If you find watercoloring too difficult after all, consider a transition to pastel techniques. You can also do this halfway on your watercolor paper, if you like. For abstract watercoloring, take transparent pigments. Here you'll find more info on watercolor paint. When you put a drop of water in a layer that isn't dry yet, you get a white "colliflower"
For adding special texture effects, use salt. Salt grains will attract water, leaving a white spot with a crystal-like texture. If you want to keep what you painted, let it dry before doing another layer, and don't brush into it. Mind that watercolor goes lighter when it dries. Don't be too afraid of strong colors. When you just start, take these basic colors. They all mix well, so you can paint whatever way you like, and have results in one session. Paint on both wet and dry paper, with a dry or a very wet brush - that's a good way to study how the water flows. Experiment with some salt too. If you don't like it, put a dry cloth on the paper (which absorbs most of the paint) and let it dry. Click here for more on abstract painting techniques. If you want to fully use the ethereal and pure colors of watercolor, don't use white. Instead, thin the paint and let the paper shine through. If things get too dark after some time, you can make things lighter again by wetting the paper and dabbing on it with a clean and dry cloth. Most of the color will be picked out. 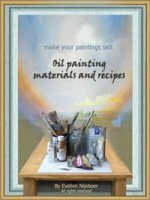 If that isn't enough, you can still bring in white paint - either int the form of watercolor or gouache, or with more solid paints like egg-tempera or acrylic paint. In any way, you don't have to be afraid of losing the light in your painting. In a more advanced watercolor technique, you sort of 'control' the unshaped watery flow. First paint a broader line of clean water, and then paint your watercolor paint halfway into that. Make horizontal, overlapping stripes with diluted paint, in a slow and deliberate way. When you're done, end with a broad line of water too. The paint wil flow down equally and dry up without any stripes. Shapes with no form can still change into anything you want. But do let you painting dry well, before you do your next layer. 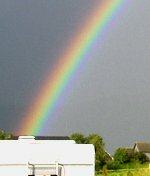 The finest paints for watercolor techniques, are the watercolor paints of the better brands (Schmincke, Winsor and Newton). Check here for a set of easy mixing colors). Good watercolor paints the finest, purest pigments and dry up without traces of binder. When you wet them again, they will partly come loose. Not all color will come out, but sharp lines will blur a little. Colored inks can be handy because they don't dissolve again once they dried, but they do leave some traces of material binder - they're not as pure and immaterial as real watercolor paints. And: not all inks are lightfast - even when they claim they are. On paper, you can use acrylics in a watercolory-way, for underpainting purposes - for pure watercolor, acrylics aren't really suitable. Watercolor paper comes in flat/smooth, or with a grain ("grain torchon"). For starting out, a rough grain is great. It makes your perception of the painting just a little unsharp, it hides little mistakes. Flat and smooth paper shows everything you did, even the smallest 'mistake'. Most watercolor paper needs stretching, because paper doesn't stay straight when wetted. There's one exception: Saunders and Waterford paper. The 140lb warps only slightly, and the 300lb quality won't give problems at all. You can work on that without stretching. The 140lb paper won't keep completely straight, but you'll be able to put your work behind glass without getting ugly folds. Stretching can be done afterwards as well, by cautiously wetting the back of the paper and stretching the paper face-down. When your watercolor is dry, you can paint on it with acrylic paint, egg-tempera or gouache if you want to. Watercolors can be used as an underpainting surface for acrylics or gouache. You can do big sphereal backgrounds first and add details later. This technique allows you to work in a dreamy mood, building up atmosphere first. Kids will love to play with colors on a wet paper. The free flow of the colors will allow them to connect with the colors on a deep emotional level - very good for their development. First give them only two colors that mix well, and let them play with that. Give them a cloth too, to dry things up a little. Watercolor technique with oil crayon. 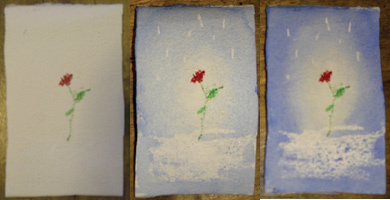 First we painted a rose and "snow" (white oil crayon).